Many of you may recall my email from August, describing My ASD training day, I spend most of time with Rio, Rosie is his sibling. Here is copy from a Maple Ridge News article. This is another successful story thanks to your support! The world will be a bit easier to get around now that Kailer has Rosie. The latter is a faithful, even-keeled black lab who’s just completed two years of training as an autism support dog and is now ready to be at 11-year-old Kailer’s side most hours of the day. 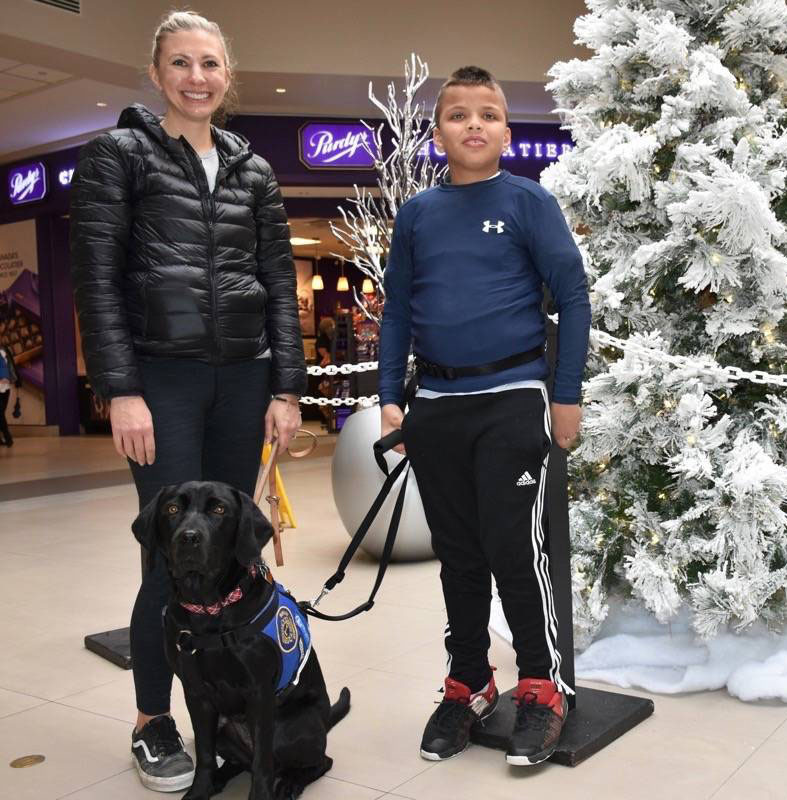 The oﬃcial ceremony marking that achievement took place Friday in Haney Place Mall, where Rosie and Kailer walked around the mall. 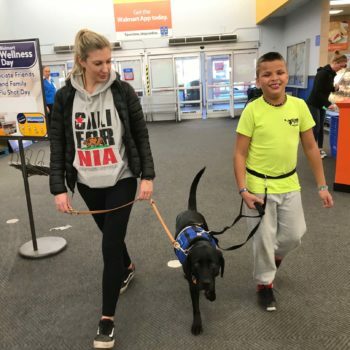 “So, Rosie’s your dog now, Kai,” said Kailer’s mom Tara, Allen. According to Autism Support Dogs, having one can increase safety and security of a child with autism. The parent holds the dog’s leash while the child is tethered to the dog via a safety harness. That prevents a child from bolting or wandering oﬀ. Such a dog can improve the child’s ability to participate in education, social and leisure activities by helping reduce the stress from such situations. 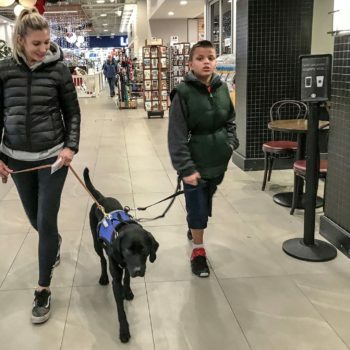 Autism Support Dogs has trained Rosie since she was a pup, then spent two weeks showing mom and son how Rosie can help. Rosie has been trained not to be distracted by noise, or food or cars or cats, and instead help Kailer get around. If he’s out with his mom and Rosie sees Kailer wandering away, she’ll just stop. 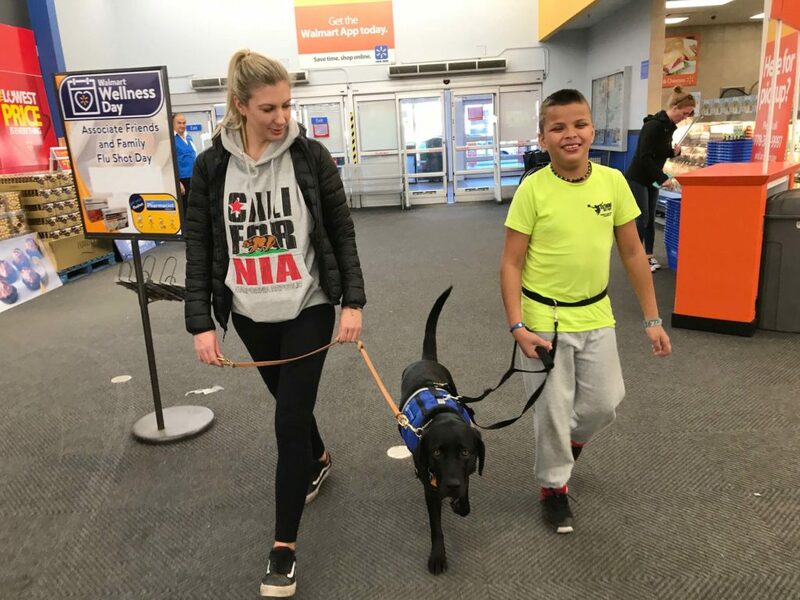 Allen said that autism support dog trainers Michelle Murray and Danielle Hyson told her everything about caring for a support dog and just dogs in general. Rosie won’t be accompanying Kailer to school, but she’ll be there when he comes home to provide companionship. Rosie provides a calming inﬂuence and a routine of exercise and feeding and sleeping. “After school, he’s happy to come home and be with his dog. It teaches him compassion too,” said Allen. Murray said Rosie loves people and loves to play, in particular, tug of war. So far this year, Autism Support Dogs have trained eight such dogs. 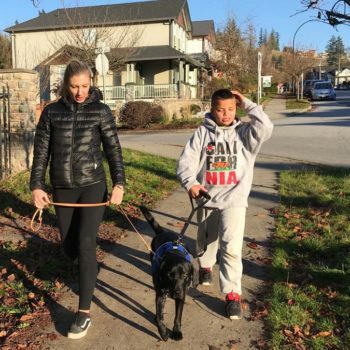 Autism Support Dogs is a division of B.C. 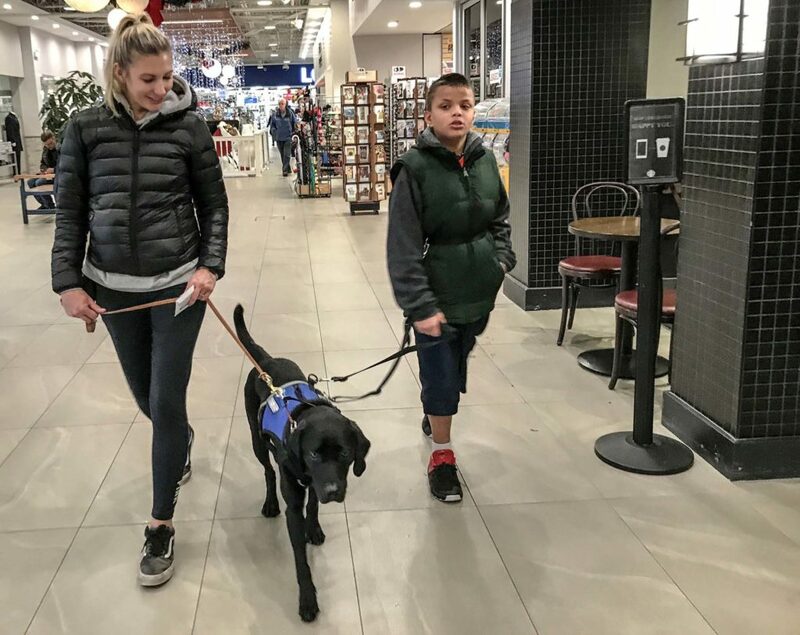 and Alberta Guide Dogs, which trains dogs for autism support, post-traumatic stress disorder and for the visually impaired. 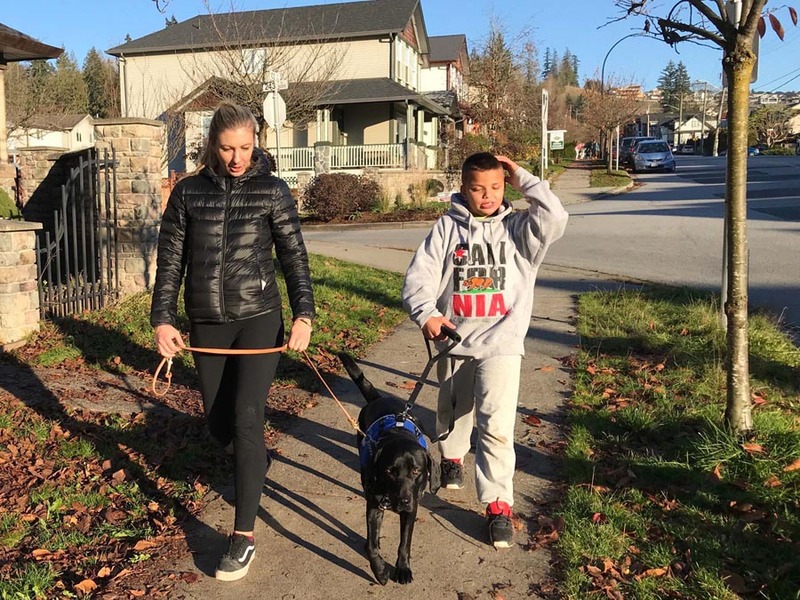 Training includes helping a dog get used to public transit, public buildings, shopping malls, parks, rec centers, and schools, as well as how to deal with the public and access issues that might arise. Each recipient is also taught about their new dog and how to properly care for it. The process concludes with a public access test, as dictated by Assistance Dogs International.